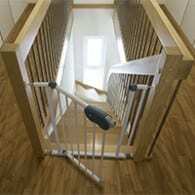 Putting a gate at the top of the stairs is like waving a red flag in front of a baby bull. The impulsive explorer scales right up the gate and rattles it back and forth until sometimes baby and gate come sliding down the stairs. Whether to rely on a gate or teach your baby how to crawl safely down stairs is a matter of baby’s temperament and crawling abilities. Watch your baby crawl toward the top step. Around ten to eleven months most babies develop some caution about heights. Some crawl toward the edge, stop, look, and feel over the edge with their hands. These are the babies who can be trained to back down the stairs safely. Impulsive babies, however, do not take time to slow down and feel for the edge; they are likely to hurl themselves down the steps. These babies and those who show quickly progressing motor and climbing skills (early walkers) are ones who need watchful monitoring and a secure safety gate.